Most people living in Manhattan do not own cars. The main methods of transportation are subways, buses, and cabs. If you are a regular taxi rider like me, you know that hailing a cab may be quick and simple, or a long and miserable process, depending on your location and time of day. For example, trying to hail a cab near the Empire State Building at 5 PM on a Friday is nearly impossible. On the other hand, near Columbus Circle on a Saturday evening, you can’t swing a Fendi purse without knocking into a cab. 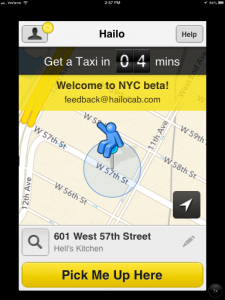 As a techie and a frequent taxi rider, I was very excited to find out about the Hailo (https://www.hailocab.com) application launching in New York City. Hailo is a free smartphone app that can be used to hail licensed taxis. It was launched in November 2011 and is available in London, Dublin, Toronto, Chicago, and Boston. Beta testing for New York started today, and the app is expected to expand shortly to Tokyo, Washington D.C., Cork, Madrid, and Barcelona. Being that I carry my iPad Mini with me everywhere and take several cab rides a week, I was excited to try this new app and applied for their Beta testing program. Today (Friday, April 26, 2013) I was notified that I was approved to be a Hail-O Beta Tester. I eagerly downloaded the application and went outside to try it out. Did I make it to the Shake Shack? … You will have to watch the video to find out. I am back home making dinner with my wife right now.